Courtesy of Eurosport, Loch Lomond, Scotland. Sharon van Rouwendaal had four incredible performances at the 2018 LEN European Championships that are being held in Scotland's Loch Lomond. 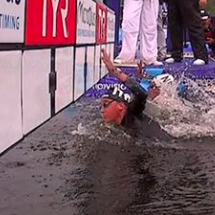 On the first day of the open water swimming competition on August 8th, she dominated the 5 km race. On the second day on August 9th, she won the 10 km race. On the third day of competition on August 11th, she was part of the winning Dutch 5 km mixed team relay. And today, only Arianna Bridi stood between her and a clean sweep of the four open water events - but only by the slimmest of margins: 0.1 seconds. Watch the Eurosport coverage of the race here.